Review Hycosan Eye Drops If you suffer from itchy, dry discomfort when wearing your lenses this is for you. I find a drop in each eye makes my eyes comfortable again for a few more hours whereas before I would have to take my lenses out. Review Hycosan Eye Drops Didn't really have much success when Ii was having problems with my eyes over the last few months. Review Hycosan Eye Drops Thanks to Hycosan my vision is clearer. Review Hycosan Eye Drops Very good wetting drops when you're eyes are starting to feel slightly dry and your contact lenses are starting to feel a bit smudgy. Review Hycosan Eye Drops Definitely helps to ease my dry eyes, great value for money. Always have it on hand for my daily use. Hycosan Eye Drops My optician recommended these to me a year ago when my dry eye symptoms got really bad. Hycosan helped a lot in soothing them - now I rarely suffer from dry eyes. Hycosan Eye Drops Best eye drops I have tried so far! They keep my eyes hydrated nearly all day long. The bottle is also great as you really just get out one drop per eye so it also last really long. Best on the market I have tried every dry eye drop on the market and hycosan are the best by far. You really must try these I was recommended to Hycosan by my optician and they really are the best eye drops I've ever used. I have suffered with dry eyes for years but not any longer. Eye drops are an easy to use and effective way to treat the symptoms of dry eye conditions. 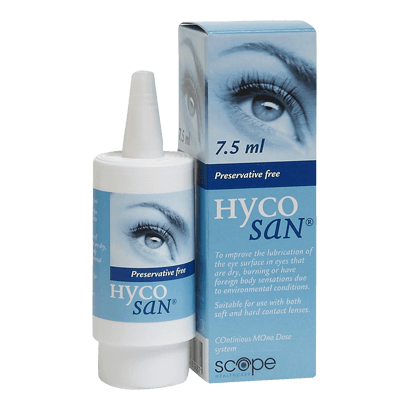 Hycosan Eye Drops are one of the most popular and trusted brands amongst lens wearers. Dry eye if left untreated can result in serious discomfort and blurred vision. High quality advanced eye drops like Hycosan can instantly make a huge difference to comfort, particularly in humid or highly air-conditioned environments. As well as directly tackling dry eye symptoms the formula actively boosts the eye's natural moisturisation mechanisms. The recommended dose is three eye drops in per eye per day. At this rate of use, each 7.5ml bottle will last for just over a month.